Sports photography refers to a large variety of activities which encompass a number of technical difficulties in terms of exposure, focus, framing, and noise reduction. In this tutorial, we will see how to process and get the best out of different types of sports photos using the many features of DxO Optics Pro. Sports photography includes many different kinds of shots, and DxO Optics Pro is particularly well-suited for processing all these types of images. Shot: Low-speed motion effect, Canon EOS-1D MkIII, 70-200 mm f/2.8 and 1.4x converter, 1/60s, f/7.1, ISO 100. Processing: DxO Standard preset, Microcontrast 60, Vibrancy 50. Sports photography encompasses many areas: individual sports, team sports, nautical sports and many others. All have their own shooting techniques and specific work methods, but also their own technical difficulties that have an impact on the quality of the photos, both at the time of shooting and during post-production. In the first case, the distance from the subject involves varying the focal length depending on the effect you want, but above all on how close you can get to the subject. The subject is always far away whether in a stadium or on a racecourse. The other difficulty concerns the backdrop: if you are relatively close to the subject, you can frame it more tightly and possibly use a large aperture to blur out the terraces and the advertising boards in the background of the picture if necessary. The subject can be moving at very high speed and its trajectory can be difficult to anticipate. Depending on the light available, you will have to increase the ISO sensitivity which can have an impact on the quality of the picture. Here again, by using the largest possible aperture you will obtain shutter speeds that are more likely to freeze the subject. (This is not obligatory, however, because by playing with lower speeds you can obtain dramatic motion trail effects.) 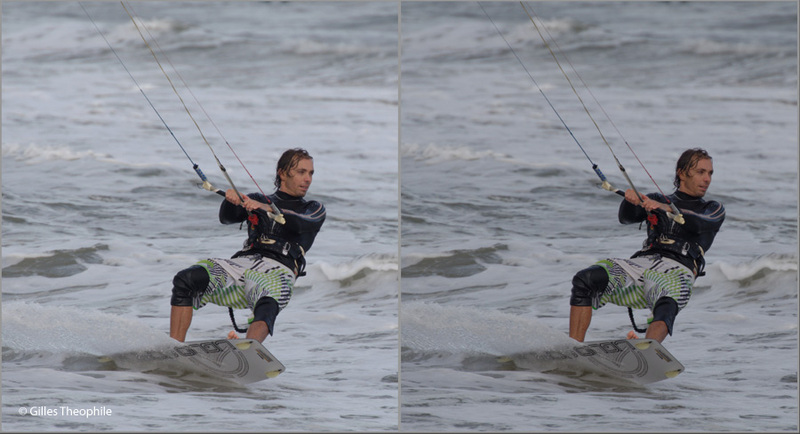 The subject’s speed is also a challenge for sharpness quality, both in manual and in autofocus mode. As for the available light, it will dictate your exposure parameters: shutter speed, aperture, and sensitivity, and in many situations you will have to make compromises. Additional considerations concerning lighting are the aspect and color of the subject. In sports photography, you will be faced with a succession of athletes, of vehicles, and of backdrops, sometimes light and sometimes dark, which requires on your part as the photographer, to have a good command of exposure and to know how to adapt it rapidly in a few seconds. If you must use long focal lengths, activate the image stabilizer and don’t hesitate to use a monopod which will have the added advantage of relieving you from the weight of the equipment, especially if you are covering lengthy sports competitions. Use wide apertures, both to fade the background to a pleasant blur and to obtain a shutter speed which must be at least equal to the lens’ focal length to avoid shake blur (for a 300 mm lens, it is recommended not to go below 1/250s). Due to changing light conditions, program your camera to automatically select ISO sensitivity, and if you want, set a threshold that must not be exceeded. Then, as you gain experience, you will get to know the best settings for the conditions you are facing at any given time. Also learn to master the exposure compensation features that you must be capable of using in the heat of the action. To put the odds of a good shot on your side, work with RAW format if possible to make the most of the dynamic correction possibilities during post-production. Use fast memory cards and, above all, do not keep your finger pressed down on the shutter release button or you will fill them in a jiffy, without mentioning that you will also saturate the camera’s buffer. Try to do short bursts at the right time: it is something you can learn, and the first stage is to get to know well the subject that you are shooting. During post-production, learn to assess the results and examine the shot parameters in the EXIF data, which will help you determine why some series are bad while others are perfectly good. Being methodical when shooting will save you a lot of time during post-production. The image correction and processing phase is at least as important as the photo shoot. This is when you will select the best pictures and get the essence out of them before you publish them, distribute them, or print them. Be aware however, that a blurred photo will remain blurred, and over-accentuating it will not solve this type of defect. The same applies to exposure: despite the dynamic range of RAW files and the capabilities of DxO Optics Pro, although they afford some latitude, there are still limits! Sports photography often means numerous shots which exponentially increase the time you spend on the computer. So a good command of the photo shoot will save you a lot of post-production work. To save time, you can also rely on DxO Optics Pro’s outstanding automatic corrections, in particular tone, color, noise and optical defects, all of which will increase your productivity when processing a large number of photos. 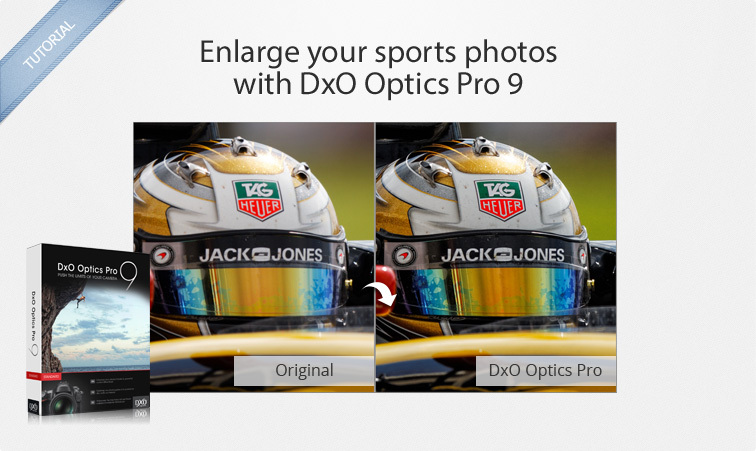 Sports photography is practically synonymous with a large number of images that need to be sorted and processed rapidly — something that DxO Optics Pro’s many powerful automatic features can easily handle. Shot: Canon EOS-1D MkIII, 600 mm f/4 IS II, 1/800s, f/5.0, ISO 100. Processing: DxO Standard preset, Microcontrast 50, Vibrancy 40. The workflow for sports shots is not very different from other areas of photography, except for the sheer quantity of shots. 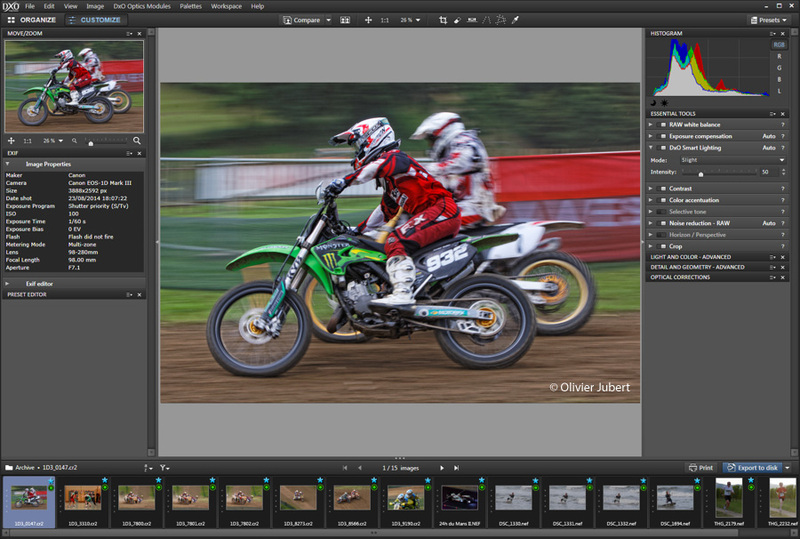 The workflow is thus quite typical: white balance, tone, colors, noise, sharpness and cropping, coupled with the good performance of DxO Optics Pro’s automated operations. 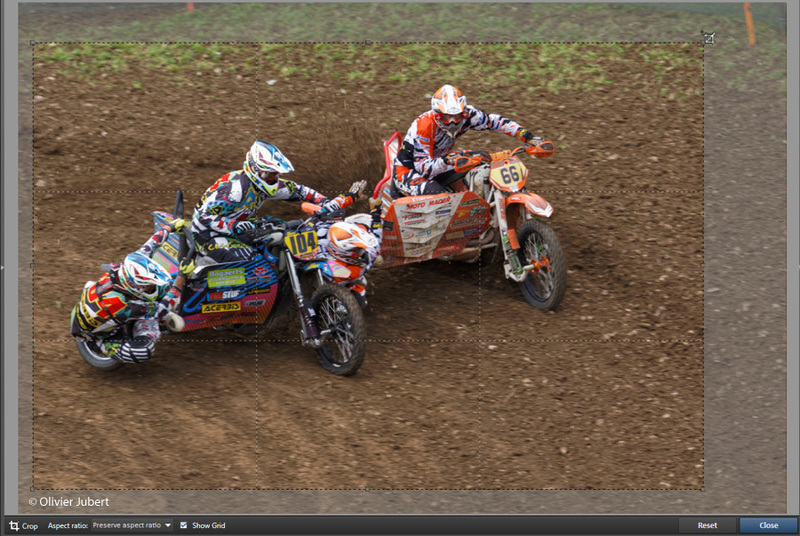 It is a good idea to select the best quality shots before opening the images in DxO Optics Pro. 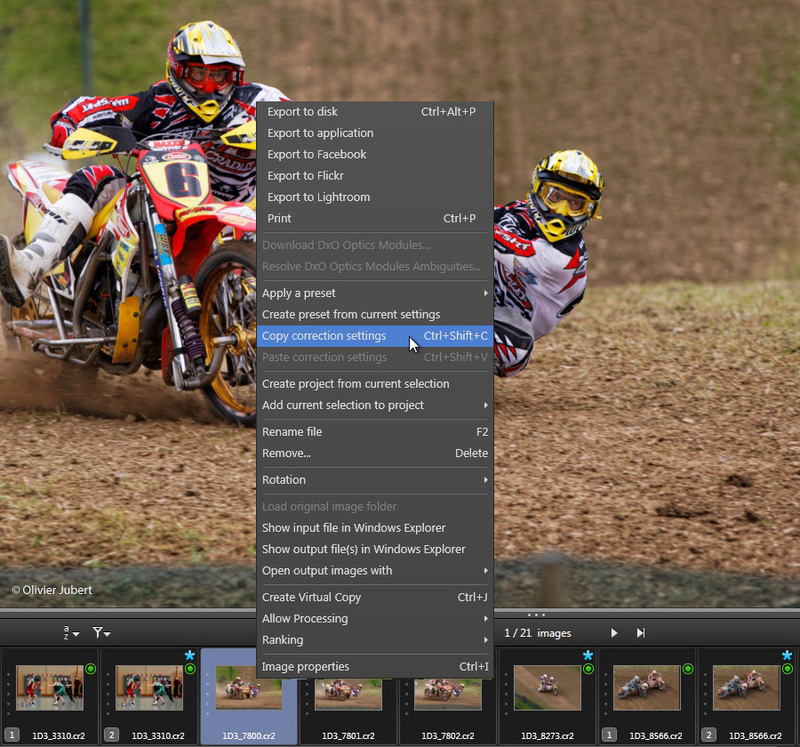 To do this, you can use your customary sorting software, then transfer the selection into DxO Optics Pro, the best example being Adobe Lightroom’s compatibility with the DxO Optics Pro plugin. For further information on the workflow with DxO Optics Pro and Adobe Lightroom, refer to our dedicated tutorial. Once you have opened the images in DxO Optics Pro, you can organise them and dispatch them into various Projects which are virtual folders. Any RAW file opened in DxO Optics Pro undergoes the default DxO Standard auto-settings, which automatically apply a number of optimized corrections to your images. In association with the DxO Optics Module that is specific for the camera/lens combination you used, the DxO Standard default preset corrects the tone (exposure), protects saturated colors, reduces noise, corrects optical defects, and optimizes sharpness – without you having to do anything. 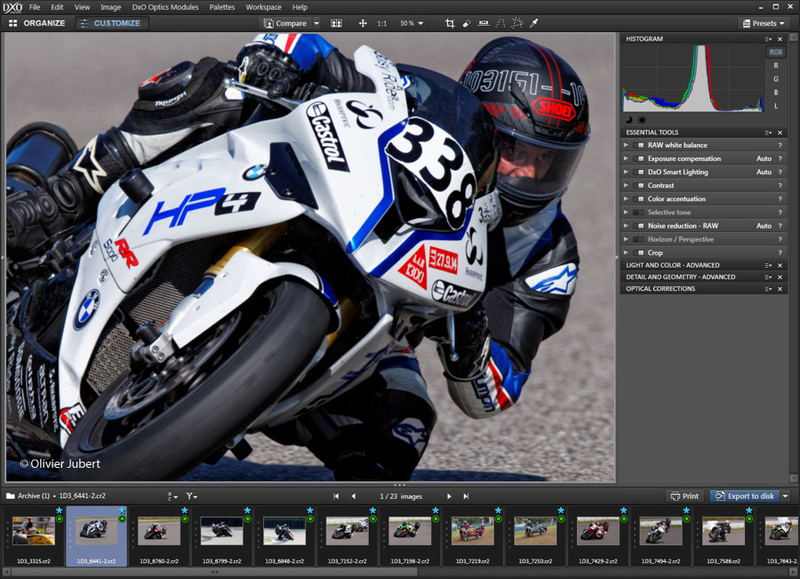 If you want to take control of or refine certain corrections, DxO Optics Pro offers a wealth of image processing tools. The DxO Standard preset notably recovered the tones in the brightest parts of the image. Shot: Nikon D7000, 70-200 mm f/2.8 VRII, 1/800s, f/5.6, ISO 200. The lighting that prevails in stadiums, gymnasiums, or even outdoors in the wild (woods, lakes, etc.) can have an influence on colors. Les curseurs Température et Teinte. Correction of white balance, with the sample taken from the gray electronics box behind the net. Shot: Canon EOS-1D MkIII, 70-200 mm f/2.8, 1/1250s, f/2.8, ISO 800. Processing: DxO Standard preset, customized white balance. In the heat of the action, in sports photography, you might sometimes pay less attention to exposure, in particular when the lighting conditions are difficult such as with backlighting or when the contrasts are strong, etc. If you want to refine the automatic correction, you can change the settings in the Exposure compensation and DxO Smart Lighting sub-palettes, either using the menu options, or using the Exposure and Intensity sliders. Another alternative is to use Selective tone, a feature intended to rapidly correct exposure problems by using sliders that act directly on specific tone ranges: bright areas, shadows, etc. Setting DxO Smart Lighting to Medium suffices to recover this image that was underexposed because of a very bright sky. Shot: Nikon D700, 70-200 mm f/2.8 VRII, matrix, 1/4000s, f/3.5, ISO 640. Processing: DxO Standard preset, DxO Smart Lighting “Medium”. The opposite of the preceding example, the camera was fooled by a light source near the axis of the sun, which resulted in an overexposed image. This was handled by setting the Exposure compensation to Priority highlights – slight, and setting DxO Smart Lighting to Medium. Shot: Nikon D700, 70-200 mm f/2.8 VRII, matrix, 1/2000s, f/3.5, ISO 640. Processing: DxO Standard preset, Exposure compensation Priority highlight “Slight”, DxO Smart Lighting “Medium”. Sports photos must have an immediate strong visual impact and therefore lend themselves well to micro-contrast and color saturation enhancements. The micro-contrast feature is located within the Essential tools / Contrast palette, and will increase micro details, while the Vibrancy slider in the same palette (under Color accentuation) will make the colors richer without affecting those that are already highly saturated. If you took your photos with a wide aperture, or using the motion trail technique, and you have strongly enhanced the subject’s sharpness, then you may find accentuation artifacts appearing in the background blur. 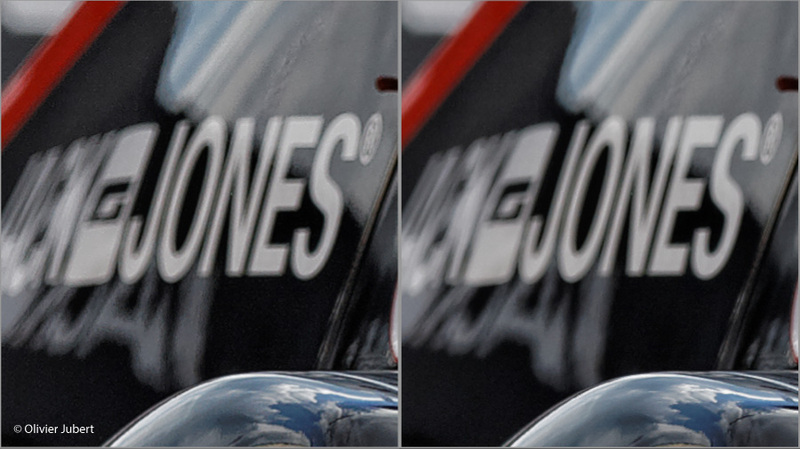 You can reduce these artifacts using the Bokeh slider located within the Optical corrections / Lens softness palette. The Vibrancy and Microcontrast sliders can give your sports photos unheard-of vividness. Here, part of the image enlarged to 100%. Shot: Canon EOS-1D MkIII, 600 mm f/4 IS II, 1/1600s, f/4.0, ISO 100. Processing: DxO Standard preset, Microcontrast 50, Vibrancy 35. The Bokeh slider lets you suppress the graceless artifacts in the background blur. As the Bokeh slider’s effects are subtle, we have enlarged this image to 200% and deliberately exaggerated them. 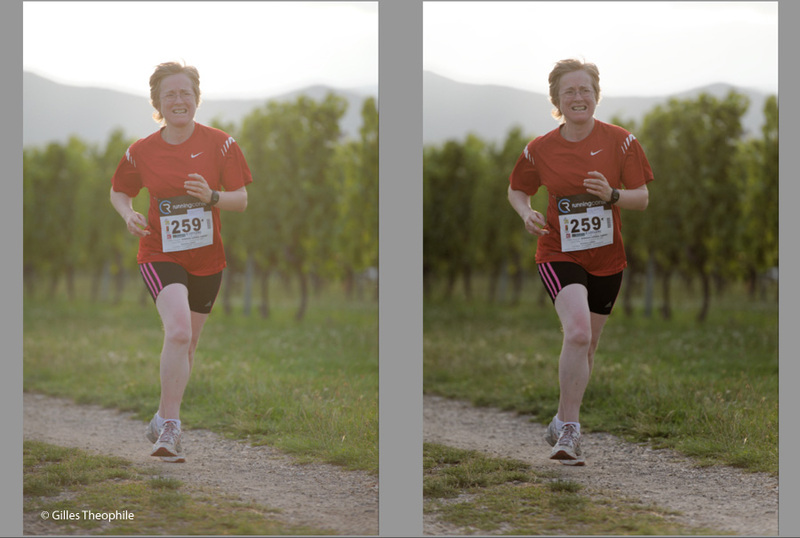 Processing: DxO Standard preset, Global slider +0,60, Bokeh slider 0 (left) and 100 (right). You can use the Bokeh slider only if your images were processed using a DxO Optics Module. 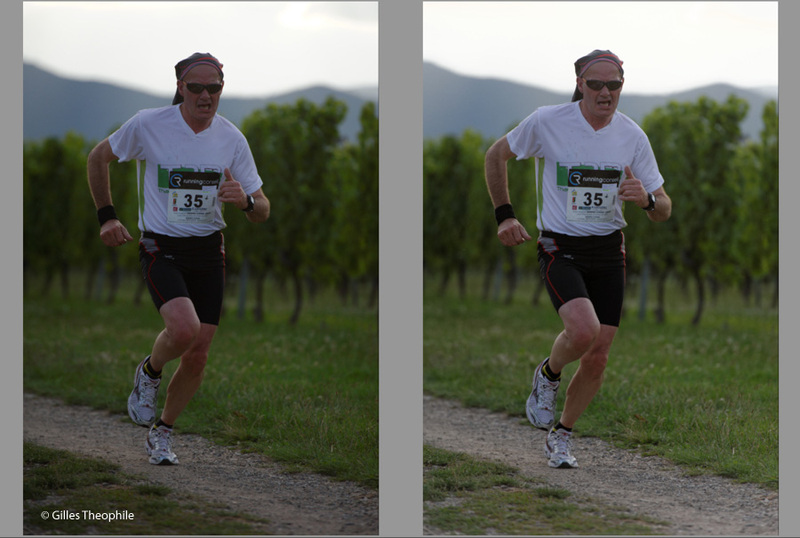 Image cropping is virtually inevitable in sports photography due to poorly-framed subjects, tilted horizons, and/or unwanted details on the image edges. The Crop tool, located in the Essential tools palette offers many combinations of width and height, while keeping the proportions of the original photo, or not. You can choose to preserve or not to preserve the aspect ratio (proportions) of the original image when cropping. Shot: Canon EOS-1D MkIII, 500 mm f/4, 1/200s, f/5,6, ISO 100. Processing: DxO Standard preset, cropping while preserving the aspect ratio. You will often find in sports photography that you end up with series of images that are nearly identical, either as a result of burst sequences, or because they were taken under the same conditions. Correct the first image, copy the settings (right-click > Copy correction settings), select the following images, paste the settings (right-click > Paste correction settings). Create a preset from the main image, and apply it to the other images (right-click > Create preset from current settings). …and then pasting them into a selection of images. One of the many advantages of DxO Optics Pro is that you can export large numbers of images in various formats to different destinations in one shot, which saves a considerable amount of time. DxO Optics Pro’s export functions offer lots of flexibility in terms of multiple and simultaneous exports to other applications and Web services. If you need to touch up certain photos, you can also use DxO Optics Pro to export them to other programs such as Adobe Photoshop or Lightroom. Sports photography, more than other areas of photography, uses high ISO settings to compensate for poor lighting conditions (night-time, bad weather, insufficient light) or to increase the shutter speed in order to stop the motion. 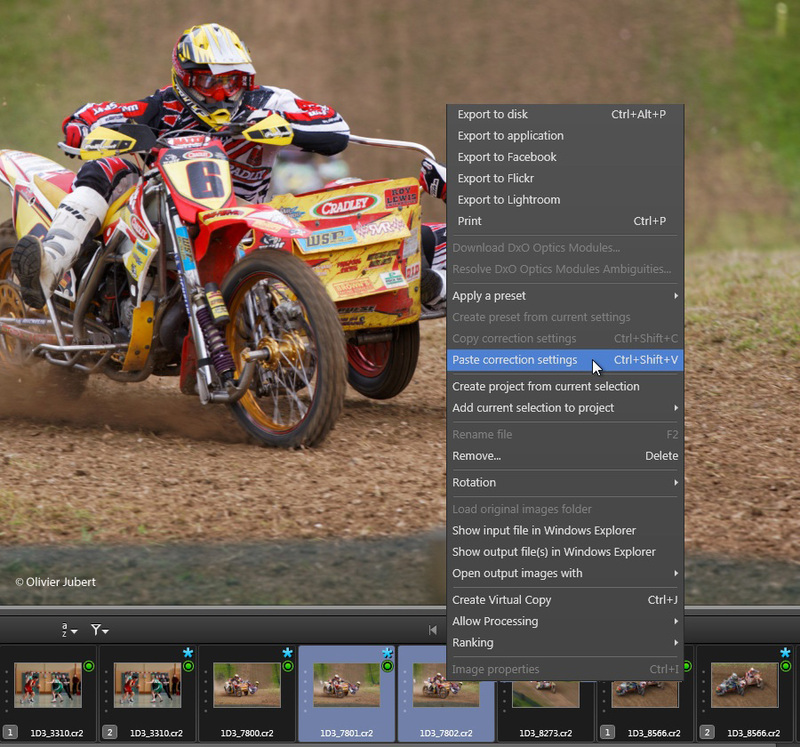 Noise reduction is part of the corrections performed automatically by the DxO Standard default preset. You can adjust these corrections manually using the Essential tools/Noise reduction palette. La correction de bruit standard de DxO Optics Pro’s standard denoising lets you quickly obtain high-quality results, including for images taken at high sensitivity (such as this one). 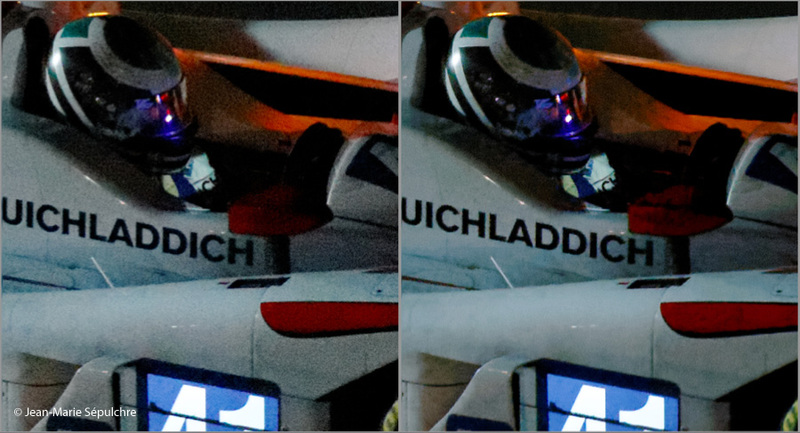 Note the efficiency of the noise reduction in areas of uniform color and at the level of the cockpit in this enlargement to 100%. Shot: Nikon D3S, 70-200 mm f/2.8, 1/2000s, f/2.8, ISO 51200. Current cameras offer such good performance in terms of high-sensitivity image quality that sports photographers can now work with ISO sensitivities that were unconceivable just a few years ago: 6400, 12800, 25600 ISO, and even higher. 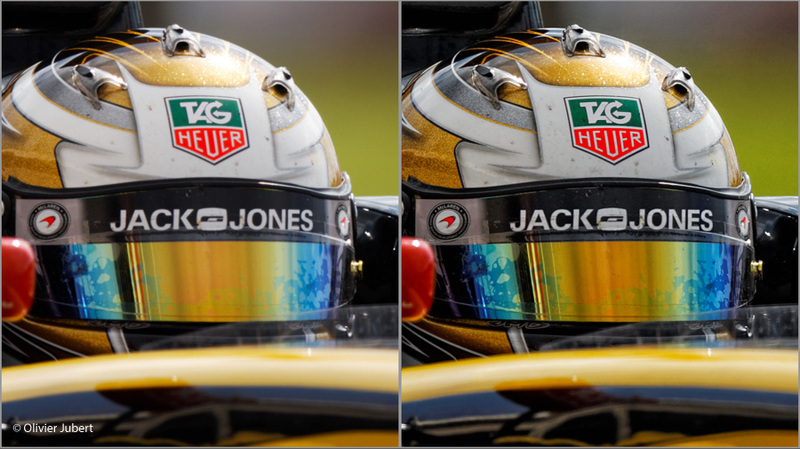 Added to that, technologies such as DxO PRIME produce amazing results in post-production. 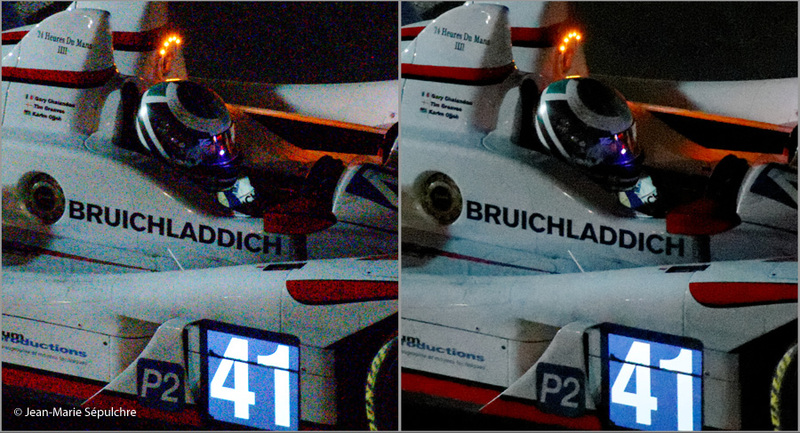 Because DxO PRIME makes no concessions on image quality, its use has an impact on processing time, which can take up to several minutes for a single photo. For this reason, it is not realistic to do batch processing on several tens or hundreds of images shot during a night-time photo-reportage using high sensitivity. You should carefully select your images prior to processing to avoid an abrupt slow down of your workflow. DxO PRIME denoising lets you go even further, all while preserving details and colors (image enlarged to 140%). Processing (left): DxO Standard preset. 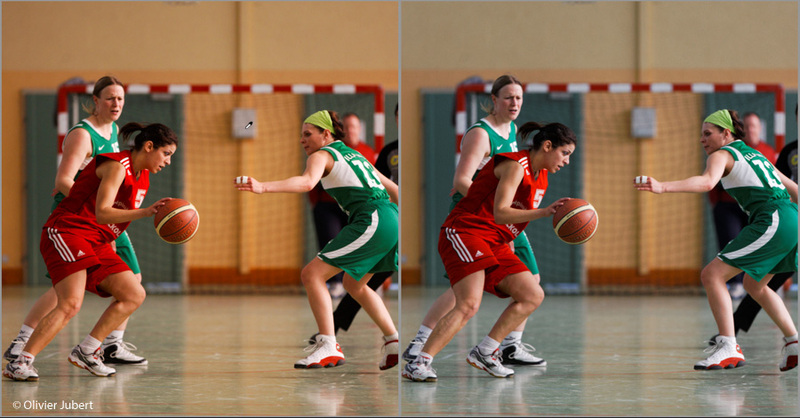 Processing (right): DxO Standard preset + DxO PRIME.